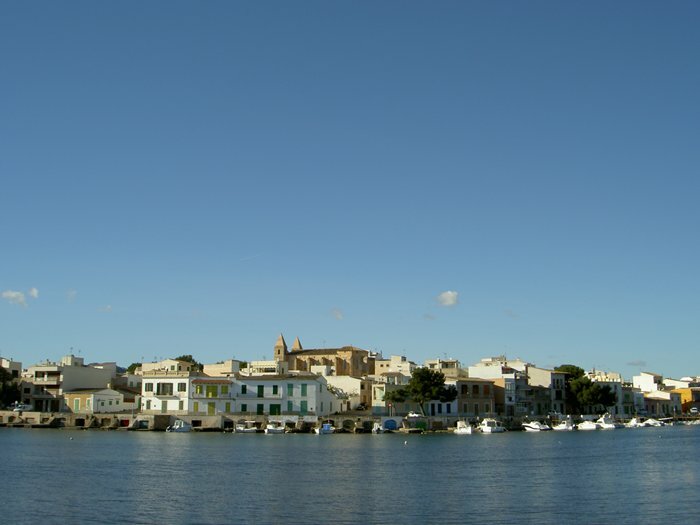 Porto Colom is a beautiful, sleepy fishing village on the southeast coast of the Balearic island of Mallorca. Porto Colom is one of the town of Felanitx (place Felanitx is about 15 km away) and is situated in the island region Migjorn de Mallorca. The scenery and location are influenced by the (our opinion) most beautiful natural harbor (Porto Colom) Mallorca Island. And the adjacent mountains, the Serres de Llevant. In the immediate vicinity is the Puig de Sant Salvador. 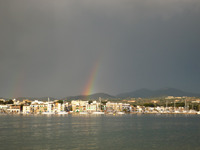 Porto Colom has two sandy beaches, the bay of Cala Marçal beach and the Arenal. Furthermore, there is a rocky, S'Algar. In Porto Colom, you have the sea on the doorstep and the mountains behind the house - in the truest sense of the word! Not for nothing Porto Colom is a very popular postcards of Mallorca. Far away from mass tourism in Mallorca, Porto Colom could get his originality and typical Spanish way of life. The overgrown with pine boardwalk offers the viewer an idyllic panorama of the port. 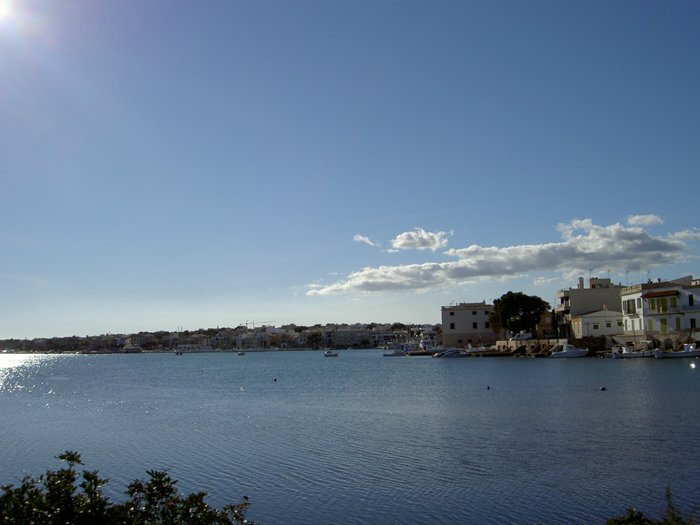 The site, located about 1,800 inhabitants of the municipality of Porto Colom, about 15 km east of Felanitx is characterized by two-to three-storey apartment buildings. The urban area is divided into the following areas: In the south between the New Town and the beach of Cala Marcal, "is the hotel district. But there are no large hotels. 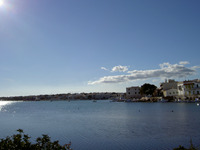 Along the inner bay, the new town was created, followed in the north of the old town of Porto Colom. As a residential neighborhood in the northern peninsula has up to the lighthouse "Sa Punta developed. This residential area is characterized in particular by the direct sea and harbor. Mostly you will find here spacious family homes. You can find various shops in Porto Colom. In addition, there are various banks, a post office and several physicians. Here you can enjoy the local cuisine in many restaurants or take a stroll through taverns and cafeterias. Especially the fish restaurants on the harbor are recommended, as Porto Colom has a still active fishing port. Despite the remoteness of the tourists in Porto Colom is on offer and around a lot: In addition to many leisure, sports and water sports venues, you will also find a very nice golf course in Porto Colom. Car and bicycle rental and tour organizer, and more, invite you to discover Porto Colom and to spend an unforgettable vacation Mallorca. The port of Porto Colom was the combination of Felanitx and DNER region Migjon de Mallorca with the outside world. The complete white wine trade with the mainland was settled about Porto Colom. Thus, the region was around Felanitx and Porto Colom time to great prosperity. The lighthouse at the harbor entrance of Porto Colom is 42 m high and was built in 1860. 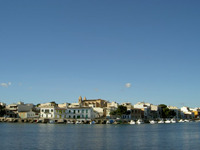 Most of the old town of Porto Colom was in the middle of de past century. The history of Porto Colom is still very much further back. So there is an excavation site of a well-preserved village dating from the Talayotkultur (the first human settlements) in the district of Can Gaia, near a cottage-villas, which you can book with us. The legend is the great navigator and explorer of the New World, "Christopher Columbus" from Porto Colom (more on this check out our article on Felanitx).